Professor Roland Fletcher in Angkor Wat's Hidden Megacity. A team of University of Sydney archaeologists, led by Dr Damian Evans, have used groundbreaking laser imaging to map central Angkor and to help identify how unstable climate change damaged the city's water system and contributed to its demise. Their groundbreaking work is the subject of a new SBS documentary. 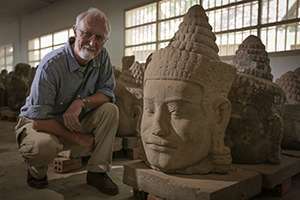 Professor Roland Fletcher leads the Greater Angkor Project in Cambodia, a major international effort to map the great pre-industrial, dispersed, low-density city, covering an area of about 1,000 sq km. The team's discovery of roads, canals and urban landscape, which rewrites the story of Angkor, will be detailed in a two-part SBS One documentary, Angkor Wat's Hidden Megacity. The first instalment airs on Sunday, February 8, at 7.30pm. "The main discoveries of the Greater Angkor Project have been to identify the huge extent of Angkor and its character as a giant low-density city, to show how its water management network functioned and to show that the demise of Angkor was related to extremely unstable climate change causing severe damage to the water network," said Professor Fletcher, of the University's Department of Archaeology. "The LiDAR survey has now also shown that central Angkor was arranged around a road grid and that the Kulen Hills to the north of Angkor were the location of an extensive low-density urban area in the early ninth century, just as Angkor was beginning to expand," he said. LiDAR, or light detection and ranging, is a remote sensing technology carried in a plane or helicopter. A light beam is aimed at the ground and maps everything in 3D from the tops of the trees to the ground, revealing the form of the ground surface under dense forest cover. This has been crucial for mapping central Angkor and the Kulen Hills which are still densely forested. "The University of Sydney is a leader in urban archaeology," says Professor Fletcher. "The particular significance of the Greater Angkor Project is that the University supports highly specialized and diverse research disciplines, producing results of global relevance, which relate to contemporary issues such as low-density urbanism and the risks of climate change."